I remember my last week in England before emigrating to New Zealand. We spent it at a friend’s flat in London. On the day we were leaving, I went for a walk alone in random London streets and tried to soak in the feel of the air and the smells of an English morning. I tried to remember everything. I almost succeeded. There were some kids playing in a playground. There was a busy, bustling street market, I ate a full English fry-up in an unhygienic café, and the temperature was chilly even though the sun was out. Completely disregarding a three month tour of Asia en-route, we landed in Christchurch on a day very similar to the London day we’d left behind. My new boss picked us up at the airport, and took us back to his house for a ‘welcome to New Zealand’ cup of tea. Our possessions were still on a ship in a container, and our rental property was in an isolated town about two and a half hours North of Christchurch. We stayed in a hotel on Cathedral Square, bought a Toyota Camry and some clothes for me to wear in the classroom. We bought sheets and pots and pans, enough to tide us over before our container arrived, and loaded them into the boot of the new car. Then we headed North up State Highway One, blown away by the beauty of the landscape, the fact that we shared the road with so few, and the slow pace and friendly warmth of Aotearoa compared to the UK. That was ten years ago and I’m applying for New Zealand citizenship at the moment. I’ve returned to England for visits twice since then and each time I’ve itched to get straight back on the plane and fly back to NZ. It’s okay to look back at that morning walk in London and remember, but there’s no going back. 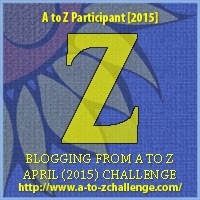 And so the A to Z Challenge comes to an end. Phew! I’ve learnt so much through both writing these posts and discovering other blogs this month. I really want to thank everyone who has visited, liked, commented and kept coming back. I’ll post sometime in May reflecting on the process. In the meantime, I have at last thought of a name for this blog – Fecund – and I’ll be redesigning the site accordingly while I rest from writing posts for a couple of weeks. This has been a fun journey Becca. We learned a lot about you and had a wonderful time along the way. Very nicely done! Congrats for making it to the end of A to Z!! That’s amazing that you’re so nicely settled in NZ. I have yet to go, I really want to do a two week road trip there — if I do I’ll be sure to ask you for recommendations. I have to admit that although we are really happy in HK, I want to go back to the UK at some point. Unlike you when I go back I don’t want to leave.